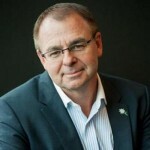 The recent Productivity Commission preliminary findings report into Competition in the Human Services makes for very interesting reading for the Not for Profit sector writes, David Crosbie, CEO of Community Council for Australia. 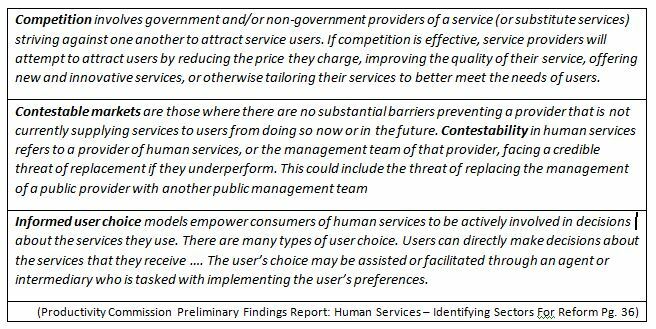 The Productivity Commission’s preliminary findings raise fundamental questions about what competition, contestability and user choice actually mean in human services. Perhaps just as importantly, it highlights the role of politics in these discussions. I am not an economist and I struggle with the notion of applying the concepts of competition, contestability and user choice in what I see as distorted markets. Most commercial markets operate on the principle of competing to provide what the customer wants to buy. The prize is profit. I can choose which car I buy and where I buy it, and they get my money / investment. This kind of open commercial market seems a long way from the typical human service provision. In areas like health, it seems to me the provider has a much greater say in what options are available. Providers often compete in service provision, but their competition is to attract the main customer, the government. Providers compete to have governments fund their services or (in the case of many professional groups) to obtain higher fees for their programs and services. I am a male, over 50 years of age. I try not to go to the doctor because I know if I see a doctor, I will be asked to make several more appointments for various tests and screens. None of these additional appointments will be done on the doctor’s premises or at the same time. Most of the additional appointments will require me to make another doctor’s appointment to get my results, which may then lead to further specialist appointments and trips to the pharmacy, all again in other locations. Like many of you reading this article, I am very time poor. My health is passable, my fitness OK, so I wait for either a health breakdown (touch wood I stay healthy) or a break in my schedule to enable me to devote a few days of appointments to my preventative health, which never quite seems to happen. The primary health care product or service I want and need is not available, and I am a well-informed consumer who can afford to pay. I cannot go to a primary care service and in one day see a doctor, have my tests and screens, buy whatever prescriptions are needed, all at the one premise or in just one or two visits. My one visit to the doctor will almost certainly require at least three new appointments at different premises for different purposes (tests, screening, medications, results etc.). The lack of an effective primary health care service is not a reflection of low demand. The reason primary health care is not responsive to the needs of many consumers is because it does not suit the providers who fight to maintain their income by separating out their specialist service into a sub-market, restrict its supply, and operate what could only be described as mini cartels to exploit governments and consumers. How else do you describe the $4 billion a year payment the government gives a select group of pharmacy owners (on top of Medicare etc.) in a secret agreement (even the government cannot identify what owners receive what payments) that also restricts who can own or operate a pharmacy and where they can operate? When you look through the almost 300 submissions to the Productivity Commission Inquiry into Human Services, there are more from health professionals and their unions than any other groups. What most of these submissions seek to do is maintain the status quo – protect their exclusivity and relatively high incomes. Not all GPs are focused on consumer health, wellbeing or choice. There is no clear data about the effectiveness of GP services, let alone outcome data about how much more or less healthy we are for receiving a service. The RACGP submission is arguing that GPs must continue to be allowed to charge the government to see whoever they like for whatever they like from their “stand and deliver”, “take it or leave it” service model. Most importantly, we should never ask a consumer what their health needs might be because that is a very difficult area and they wouldn’t know except for prices (and even then…). The reality is that very powerful anti-competitive cartels operate across our health system. They have one real purpose – protect and increase incomes. It is not just GPs or specialists. Pharmacies make significant profits selling completely useless snake oil products that cash in on poor health literacy and high marketing budgets (how many “fat blaster” type products do you need on one shelf?). They also have the audacity to continually seek to extend their role as primary health care providers while maintaining their monopoly and secrecy. If the provision of pharmacy services is really important to our health and wellbeing why can’t we have fully trained and licensed pharmacists in our major supermarkets (as in New Zealand where the cost of medicines is considerably lower and access much better) or in our doctor’s surgeries? So why are pharmacies not on the list of human services the Productivity Commission believes would benefit from competition? The simple answer is politics. The Pharmacy Guild is one of the most powerful political lobby groups in Australia. The AMA is not that far behind. 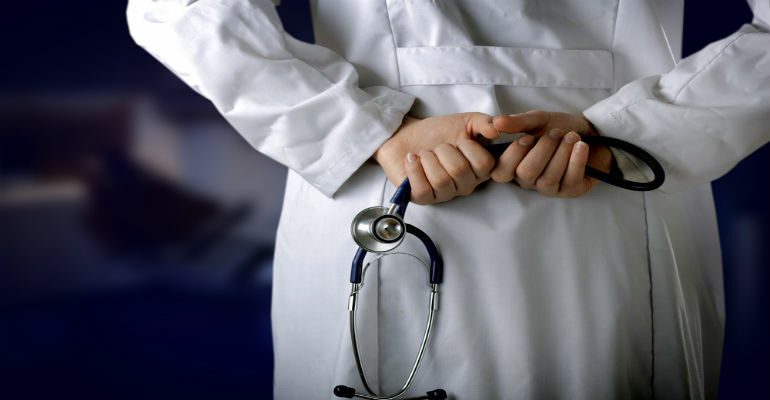 Like the Pharmacy Guild, the various colleges of medical specialists operate some of the most effective business cartels in the world – restricting how many places and controlling who can enter (tough for women or overseas trained specialists) while inflating their fees and charges to ensure massive incomes. grant-based family and community services. Contrary to some reports, CCA is not opposed to all competition or consumer choice and will be seeking guidance from its members in relation to these recommendations. The CCA submission in response to the PC preliminary report will also be asking for a more detailed rationale as to why the most obvious cases where competition has been shown to deliver better outcomes, like pharmacy services, do not even rate a mention in this report. Oh wow, the level of misinformation and completely incorrect “facts” in this article woul dmake even Andrew Bolt blush.